NaNoWriMo has taught me a couple of things. I know, I know. You’re like, ALREADY?! It’s been…nine days. But these are pretty basic, so I’m going to get them off my chest. First, I only have a certain number of non-academic words in me per day. In my hey-day, I could pull off a fifteen-page paper in one sitting, if the occasion arose (and I’d been that bad about procrastinating, which was almost always, truth to tell). But as I’ve been blogging over the last six months and writing fiction for the last nine days, I’ve come to the conclusion that I now only have about 2,500 words in me at any given time. After that threshold I get irritable and unhappy and start taking coffee breaks (even if it’s just to stand in front of the coffeemaker, and not actually refill my cup) every five minutes or so. Very Maddening Behavior. So I’m behind on NaNo, and I’m behind on my blog, and I don’t really know that I can do both well at the same time. This is sort of an apology/excuse in advance, in case you weren’t picking up the hints. I may be around a little less for a couple of weeks while I try to salvage my word count. 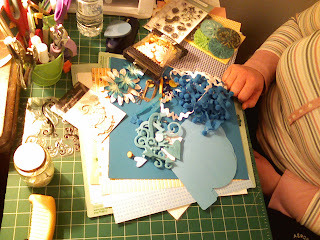 Photos are of Ginny’s (best sister ever) work space & latest project. Guess the theme? 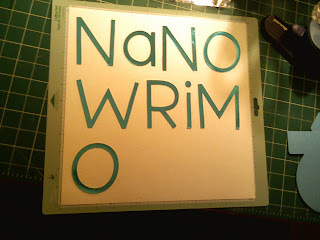 I am doing NaNoWriMo, too. It's really making November fly by. I have found I can write about 2,000 words in a day before I am in desperate need of chocolate! I've found the same thing. I used to churn out academic stuff in no time flat, but fiction? Fiction takes me forever. God yes, 2500 a day is really good going, and exhausting too. I'm happy when I stick to my 1000-a-day requirement, cos if I don't I have to make it up at the end of the week. Stephen King recommends 2000 a day, but he doesn't have to work full time like the rest of us mere mortals! Good luck with Nano! I feel like I'm the only one not doing it. ewww, 2500 words a day. . . Good Luck!